HOW DID THE AZTEC EMPIRE EXPAND? Following the Aztec’s founding and construction of Tenochtitlan in the Valley of Mexico in 1325, they quickly established their authority across the other societies in the valley. At the time the Valley of Mexico was populated by many different powerful civilizations, including: Chalco, Tepanec, Tlacopan, Texcoco, Culhuacan, and Chichimec. Several of these civilizations were also on the shores of Lake Texcoco, including the Culhuacan which were on the south shore. One of the ways in which the Aztec expanded in strength and wealth at the time was by acting as mercenaries and warriors for other societies in the region. For example, in the decades after the founding of Tenochtitlan they worked as warriors for the Tepanec people. The Tepanec used the Aztec to help with their battles and campaigns in the region against other rival societies. For their help the Aztec received portions of the wealth that the Tepanec gathered from the societies that they defeated. As a result, the city of Tenochtitlan grew in importance and wealth throughout the 14th and 15th centuries. In general though, the Aztec were subjects of the more powerful Tepanec and Aztec leaders were only allowed to remain in power by paying tribute to the Tepanec. Also, during this time period, Aztec rulers increased the power of their society by forming strong alliances with other societies around Lake Texcoco. However, the relationship between the Aztecs and the Tepanec soon became strained and a conflict emerged. Aztec warriors from the Florentine Codex. 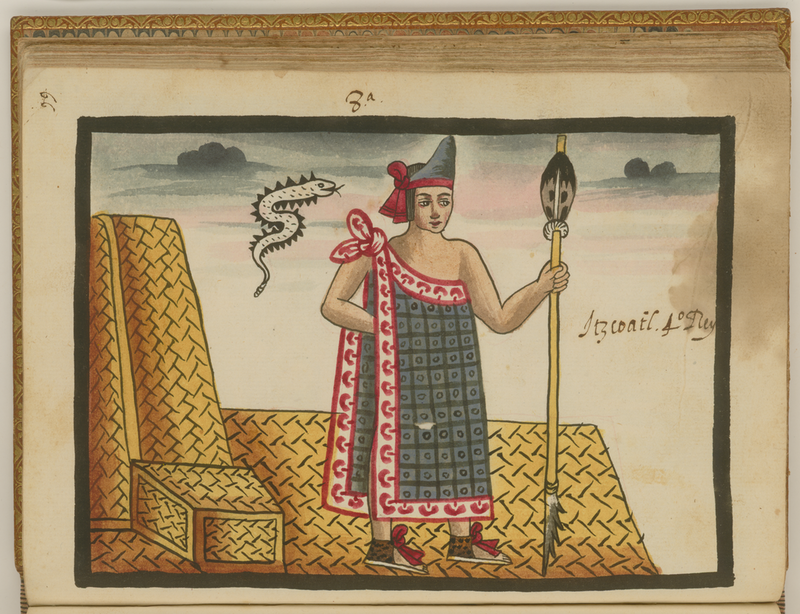 Itzcoatl became the leader of the Aztec in 1427 and became the fourth tlatoani of the Aztec people. He reigned over the Aztec Empire from 1427 until 1440, and is best remembered as the leader who saw the Aztecs become the most powerful Mesoamerican society in the Valley of Mexico. For example, as leader he famously formed an alliance with two other societies in the area in order to overthrow their mutual rivals. The Aztecs, Texcoco and Tlacopan joined forces in 1428 to create the Triple Alliance. Together they fought against the Tepanec and challenged them for superiority in the Valley of Mexico. Over time the three were able to overpower all other societies in the Valley of Mexico. As well, the Aztec became the strongest of the Triple Alliance and Tenochtitlan became the center of power in the region. Itzcoatl from the Tovar Codex. All of the Aztec rulers at this time pushed forward with expanding the Aztec Empire across Mexico and strengthening the power of Tenochtitlan. In fact, the city grew in size and importance during this time as the Aztec culture came to dominate the region. 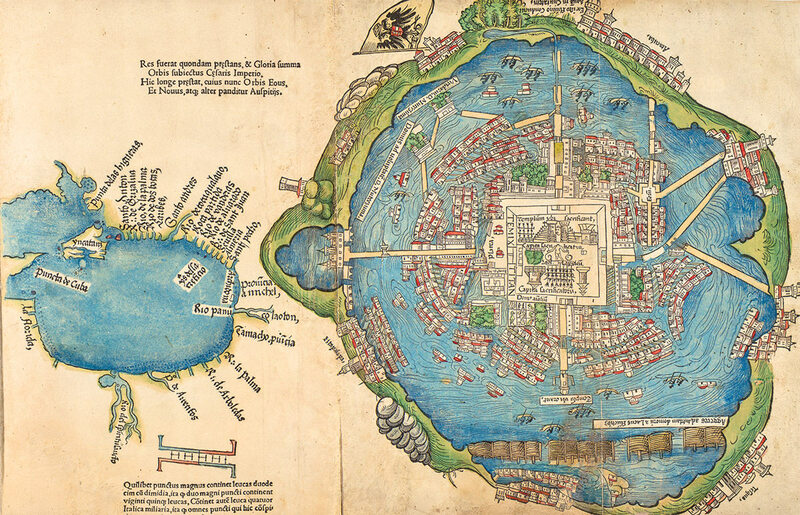 For example, by the early 16th century, Tenochtitlan is estimated to have been three to five square miles (eight to thirteen square kilometers), and have a population of between 200,000 and 300,000 people. This means that it was one of the largest cities in the world at the time and larger than any in Europe. 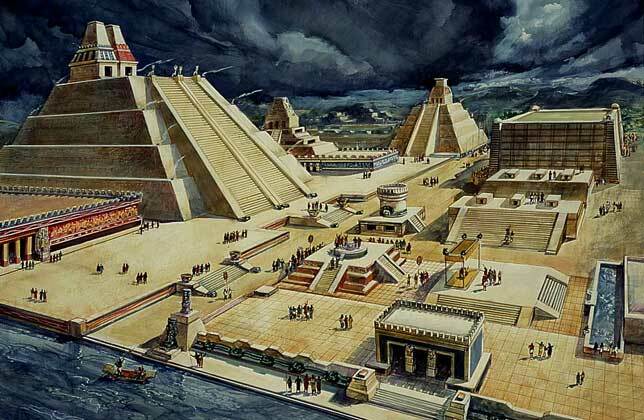 As well, the Aztec Empire had spread far from the Valley of Mexico during this time and, at its height, the empire consisted of land across most of central Mexico including the coastlines in both the Gulf of Mexico and Pacific Ocean. This vast expansion meant that the Aztec had conquered and suppressed many different groups of Mesoamerican peoples. The Aztec controlled these different societies by forcing them to provide tributes for payment and ritual sacrifice. By the time of the arrival of Spanish conquistadors to the Aztec territory in 1519, the Aztecs were the most powerful society in all of Mesoamerica.